It's time to party! These cupcakes will brighten everyone's day. Heat the oven to 190°C / fan 170°C / gas 5. Butter a 12 hole muffin tin. Cream together the butter and sugar with an electric whisk. Add the flour, baking powder, vanilla extract and continue to whisk together until everything is combined. Divide the mixture evenly into the muffin tins and bake for 15-20 minutes. Take out of the oven and transfer to a metal rack. While the cakes are cooling, make the frosting. When they've cooled, using a sharp knife, cut a hole in the centre of each cake and then add 1 tsp of raspberry jam to each. Cream the butter on its own for about 5 minutes on a medium speed. Sift the icing sugar into the creamed butter and then mix together on a slow speed. Gradually increase the speed until it forms a thick paste. Add the vanilla extract and milk if needed and whisk together for one minute. Put your frosting into the piping bag with the nozzle of your choice. Pipe each cake. 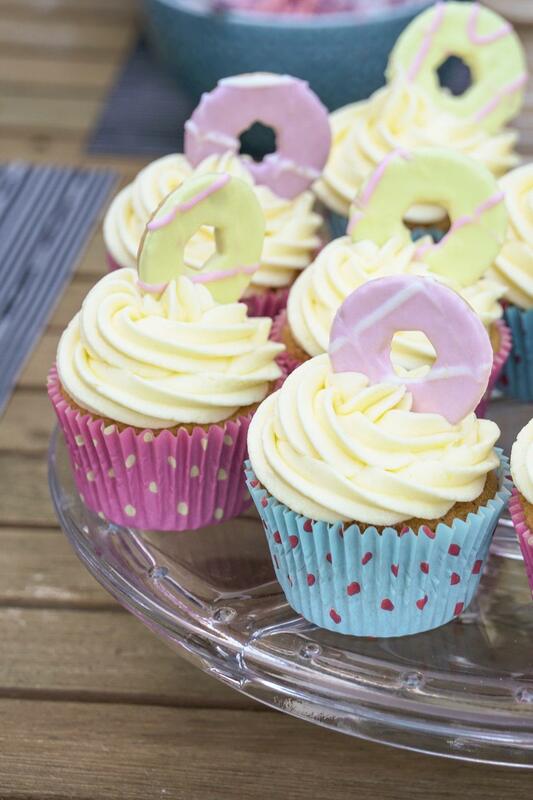 Add a party ring of your choice to your frosting. Serve and enjoy! The cupcakes should last for 2-3 days.